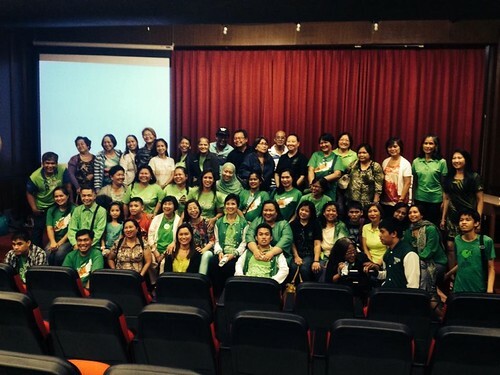 The General Assembly of the Autism Society Philippines convened at the MERALCO Multi-Purpose Hall on 25 October 2014 at 1pm. Members and chapter leaders arrived from all over the country -- from San Fernando, La Union to Naga, Camarines Sur. The event kicked off with an ice breaker from the gracious duo of Trustees Grace Adviento and Peng So. Jan Peňa, our outgoing President recounted what our advocacy has accomplished over the last two years -- our reasons to celebrate -- and what we continue to aspire for. Treasurer Evelyn Go -- our “ingat-yaman” -- reported on the society’s financial standing. Election Committee Chair Ranil Sorongon facilitated the pre-election and asked the confirmed candidates to introduce themselves and to share how they wanted to contribute to the organization. Memorable was an emotional speech from Grace Adviento who shared that service to ASP is difficult, time-consuming work; and while most of the veteran trustees would like to “rest” from service, they cannot do so until the next generation of leaders step up to contribute to the advocacy. Secretary Mona Magno-Veluz read provisions from the by-laws and declared a quorum to kick off the elections. For the first time in the association's history, ASP honored on-line votes from members outside the National Capital Region. During the tabulation of votes, a Town Hall meeting was moderated by Chair Emeritus Dang Koe and opened the floor to comments, suggestions and requests. -Mona Veluz asked the self advocates present at the assembly, how ASP can help make their lives better and what activity or project would make them happy. - Ranil shared that the next ASEAN Autism Network meeting will be in Malaysia in 2015 and would like to ask for help from ASP to help prepare our delegation for the Autism Olympics and the Conference. The general assembly ratified the proposed ASP By-Laws by a landslide. The nine newly-elected ASP trustees met after the assembly to vote on the Autism Society Philippines’ officers for 2014 - 2016. Congratulations to all those who have been called to serve -- and may your leadership bring ASP to loftier heights. Read more about them here. According to the ASP Policy 14-0033 on Organization Design, Item 6.2.3.3: In the event of board vacancy, the Board of Trustees will nominate candidates from the pool of active members who meet the criteria for ASP Trustees and will collectively decide who among the nominees shall fill up the board vacancy. This decision will be made over the next few weeks.